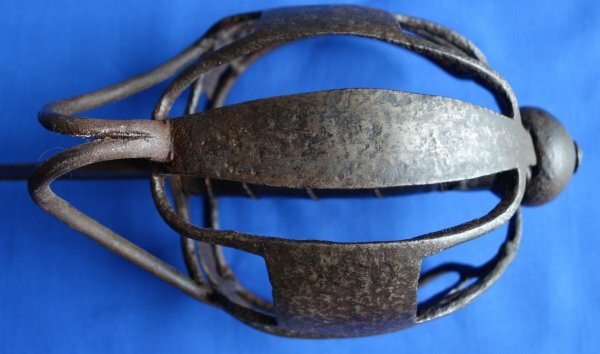 In overall good condition for its age, a rare circa 1670 Scottish Horseman's Basket Hilted Backsword. 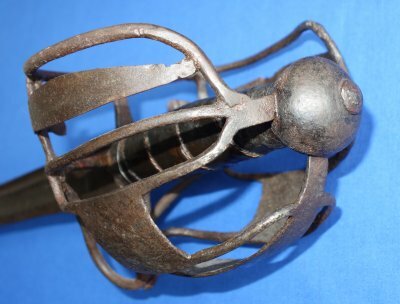 This later variant of basket hilt with plain panels and flat / widened back bars / mini-panels (side guard) dates the sword from 1670 to 1680, the plain ball pommel means it is early rather than later, so almost certainly 1670 give or take. 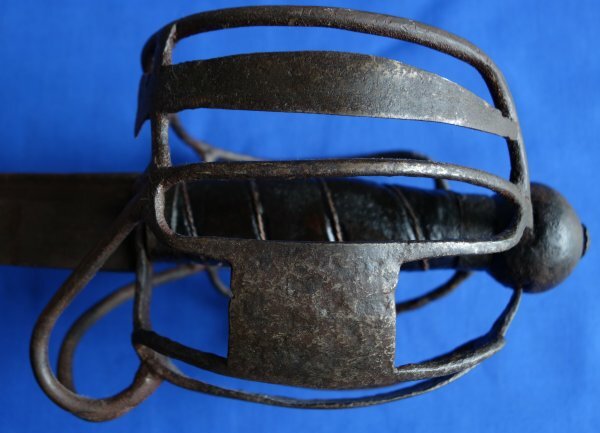 There are no maker marks to the blade, though it is almost certainly Prussian made. One of the main front panels (outer shield) bears the period inscription "P B", almost certainly the owner's initials. 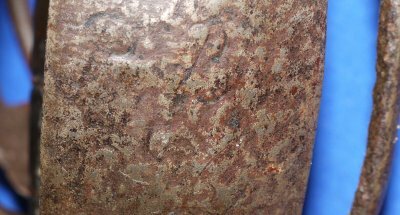 There is more inscription than that, and on the other main front panel (inner guard), but it is too aged / worn to determine. 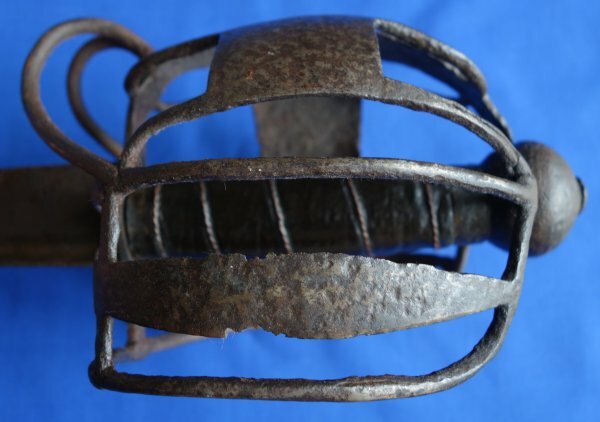 On the base of the guard / quillon, there appears to be a sword slippers (makers / cutlers) mark, again very worn. The 35 5/8 inch blade is in fair to good condition; there is some wobble to the blade, especially nearer the tip, plus some period nicks / gouges to the cutting edge; if only this sword could talk. The blade is relatively firm on the hilt. 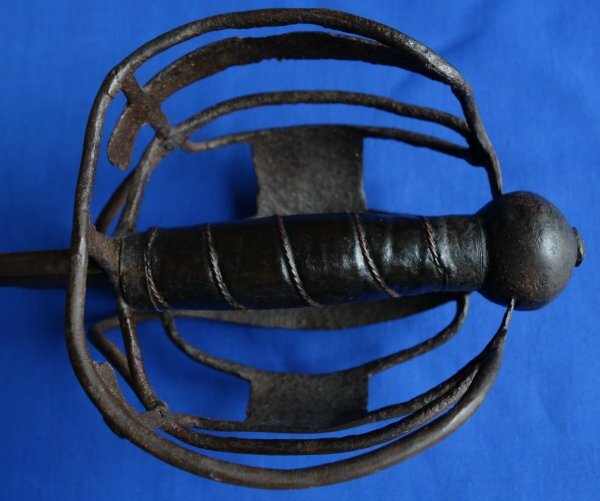 The hilt though very aged and with some corrosion loss, is in remarkably good condition overall. The grip is a old but more recent replacement. A superb sword with an obvious violent past. A truly evocative and solid investment for just £? 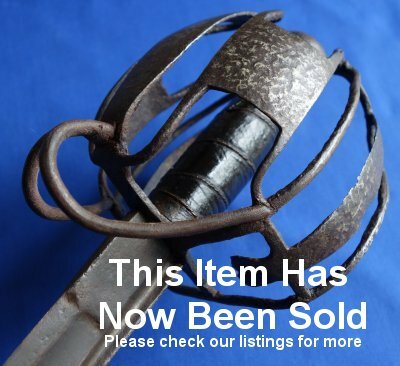 (too late, now sold). Please quote item reference number AA59 (0050). Further / full sized pictures available upon request.